In our instantly connected world, it’s surprisingly easy to lose our connection to God. This devotional taps Amish wisdom in order to help us draw closer to God and hear his voice. In The One Year Book of Amish Peace, you’ll get a daily taste of Amish values and wisdom. 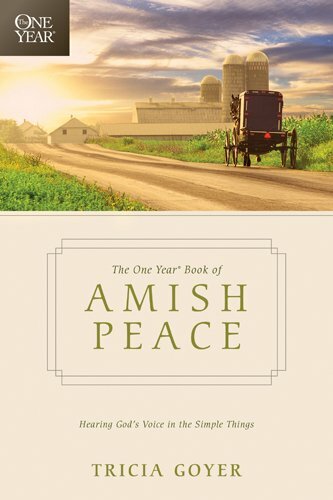 In The One Year Book of Amish Peace, you’ll get a daily taste of Amish values and wisdom. Tricia Goyer shares her fascination with the Amish in a way that will inspire and encourage believers to carve out more time in each day to listen to God and experience his presence. This daily devotional contains interesting facts about the Amish, recipes, and information about the way the Amish handle money, rear their children, and center their lives on faith in God. You’ll be inspired to slow down and find ways to simplify so that you, too, can experience God in the ordinary. Download the printable Amish Peace Recipe Card.